Hydrous partial melting of oceanic gabbro as a consequence of fluid/rock interaction at very high temperatures is regarded as an important process for the formation of felsic lithologies within the oceanic crust. 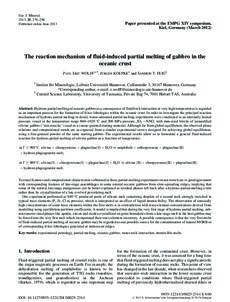 In order to investigate the principal reaction mechanism of hydrous partial melting in detail, water-saturated partial melting experiments were conducted in an internally heated pressure vessel in the temperature range 860-1020 °C and 200 MPa pressure, fO2 ~NNO, with mm-sized blocks of unmodified olivine gabbro ("microrocks") used as a coarse-grained starting material. Although far from global equilibrium, the observed phase relations and compositional trends are as expected from a similar experimental survey designed for achieving global equilibrium, using a fine-grained powder of the same starting gabbro. The experimental results allow us to formulate a general fluid-induced reaction for hydrous partial melting of olivine gabbro as a function of temperature: at T ≤ 980°C; olivine + clinopyroxene + plagioclase(I) + H2O) amphibole + orthopyroxene + plagioclase(II) + hydrous plagiogranitic melt; at T ≥ 980°C; olivine(I) + clinopyroxene(I) + plagioclase(I) + H2O) olivine (II) + clinopyroxene(II) + plagioclase(II) + hydrous plagiogranitic melt: Textural features and compositional characteristics obtained in these partial-melting experiments on microrock are in good agreement with corresponding features of late-stage assemblages in some natural oceanic gabbros from slow-spreading ridges, implying that some of the natural late-stage parageneses can be better explained as residual phases left back after a hydrous partial-melting event rather than by crystallization of a late evolved percolating melt. One experiment performed at 940 °C produced pools of silicate melt containing droplets of a second melt strongly enriched in typical trace elements (P, Zr, Cl as proxies), which is interpreted as an effect of liquid immiscibility. The observation of unusually high concentrations of some trace elements within the first melts is in contradiction with trace-element concentrations derived from modelling using equilibrium partition coefficients. A model is implied that during the very first stage of hydrous partial melting, submicrometre sized phases like apatite, zircon and oxides crystallized on grain boundaries from a late-stage melt in the host gabbro may be forced into the very first melt which incorporated their trace-element inventory. A possible consequence is that the very first melts of fluid-induced partial melting of oceanic gabbro may be regarded as one possible source for the contamination of natural MORB or of corresponding felsic lithologies generated at mid-ocean ridges.